Everyone needs a Creamy Potato Soup Recipe and this one is sure to be a family favorite! Creamy and comforting, this soup doesn’t take long to make but tastes like you spent all day in the kitchen. As soon as the weather turns cool, my family begs for this soup and I’m sure yours will too. As soon as the weather turns cool, my family starts begging me or this Creamy Potato Soup Recipe. It’s the perfect dish after a long day of school, sports, and work or anytime you’re craving a comforting home-cooked meal. Creamy Potato Soup is easy to make, so if you’re new to cooking, you’re going to love this recipe! There are no special skills required to make this recipe. The addition of onions, carrots, celery, and garlic is what gives this soup its slow cooked taste. If you don’t have carrots or garlic on hand, it’s fine to leave them out. But I don’t recommend leaving the onion and celery out. I highly recommend buying an immersion blender if you don’t already have one. They’re not expensive and they make pureeing soups a breeze! I really can’t live without mine. You can substitute your favorite seasoning for the seasoned salt I have suggested. I love Lawry’s but you can use any all purpose seasoning. I like to adjust the salt and pepper at the end of the cooking process. Since there’s salt in the broth and seasoning, I like to wait until the end to add any extra to taste. Crisp bacon in a large dutch oven or stock pot. Remove bacon pieces and drain on paper towels. Leave rendered fat in pan (about 2-3 tablespoons, drain off any excess). Saute onions, carrots, celery, and garlic in bacon fat until lightly browned and softened (about 5 minutes). Sprinkle the flour over the vegetable mixture and cook for about one minute, stirring constantly. Slowly add the stock and milk, stirring to combine. Then gently add the diced potatoes, seasoned salt and black pepper. Stir. Bring to a low boil then let mixture simmer until the potatoes are tender and can be pierced with a fork. Using an immersion blender, puree the soup to desired consistency. Alternatively, you can puree the soup in a blender in small batches. Never fill the blender container more than halfway full! The steam from the hot soup can blow the top off the bender. If you used the blender, return soup to pan over low heat. Stir in heavy cream, if using. Serve soup with your favorite toppings. Store any leftovers in refrigerator for up to four days.. 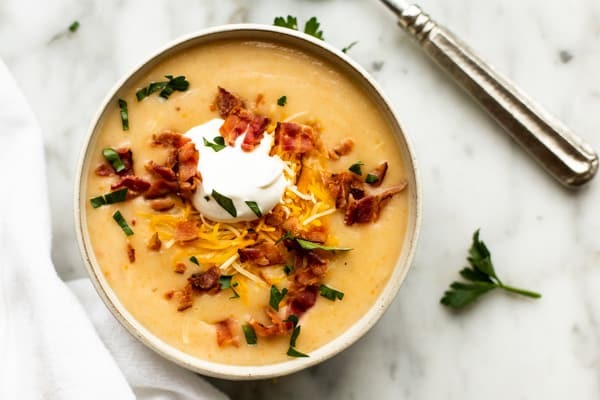 If you made this Creamy Potato Soup, or any other recipe on the blog, don’t forget to leave a rating and a comment below. I love hearing from my readers! You can also find me on Facebook, Instagram and Pinterest! I love a good soup, any time of the year and that creamy potato soup sounds so comforting! Thanks Amanda! 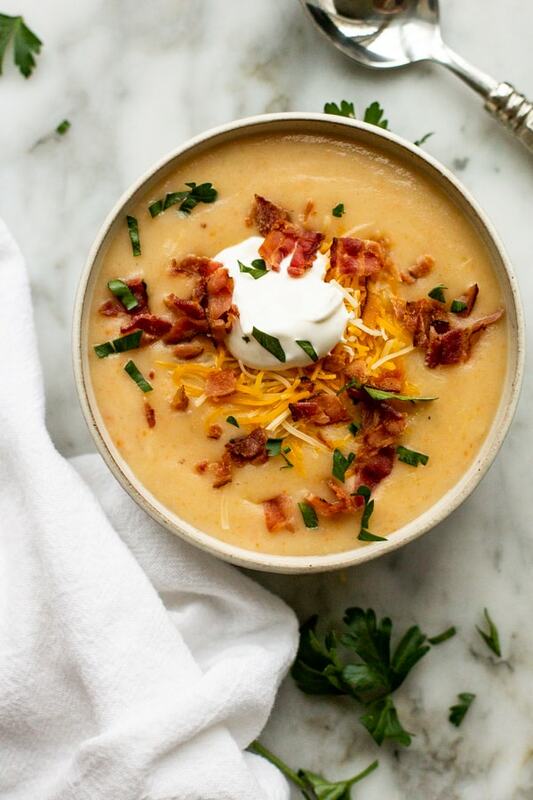 Can’t have potato soup without bacon,right? !